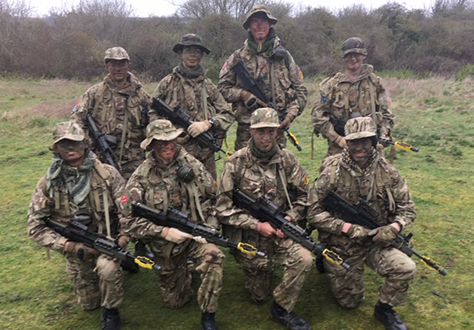 On Friday 22 March, the Charterhouse team of 8 cadets, Major Eastham and Flight Sergeant Lay left for Folkestone to attend the annual Brigade Military Skills Competition at St Martins Plain Training Area. The competition is designed to get the best cadets from their schools to compete against each other and patrol around stands which test them in a range of physically arduous and realistic military skills; all run by the regular army. Teams representing dozens of CCF’s and Army Cadet Force units competed in the competition and Charterhouse came sixth place overall. The section commanded by Henry Waldern and Charlie Timms performed well across all the stands but came first in the Close Quarter Battle (CQB) stand, first in the Dismounted Close Combat Trainer (DCCT) and first on the Obstacle Course. The cadets worked incredibly hard, putting maximum effort into each and every activity. They were a credit to both the CCF and to the School. The team looks forward to next year and returning to progress even further in the competition.